We do a lot of NHL first period betting, and that means we’re always looking at NHL first period stats. In 2016-17, first period bets accounted for virtually all of our profits. Here’s the breakdown of how our 179 hockey first period bets fared during the season. The point here isn’t to toot our own horn, but rather to show that there is great value to be found in these first period lines. Though a 179-wager sample is obviously a limited sample size, the fact that we were profitable in first period moneylines, puck lines, overs and unders illustrates what a great opportunity first period lines present. 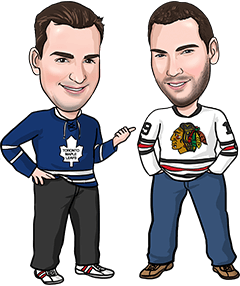 In this article, we’ll unveil our favourite places to find NHL team goals by period and explain how they can help you take advantage of first period betting odds. It isn’t always easy to find relevant NHL first period stats to help you break down those first period betting lines. Here are our three favourite sources that we frequent on a daily basis. When the NHL redesigned its website in 2016, it received plenty of criticism. But while it may take you more clicks than it should to get the information you’re looking for, there still is a lot of valuable info to be found. That includes NHL first period stats, which you can find here. On this page, you can see how many goals each team has scored in the first period on the season as well as how many they’ve allowed. Knowing how many goals a team has scored in first periods and how many they’ve given up is certainly helpful for NHL first period betting. However, outliers (like when teams score four first-period goals in one game) can skew those stats, especially early in the season. When you’re betting first period moneylines, you’re more concerned about finding teams that are consistently strong in first periods. On Hockey-reference.com, you can find each team’s record when leading, trailing or being tied after one period. You can access them by clicking on whatever team you’re interested in seeing the first period stats for, then clicking on ‘situational’ in the menu bar (see the red arrow in the screenshot below). On the situational page for each team, you’ll be able to find the number of times they’ve led, trailed or been tied after each period. You can also see each team’s record when scoring first or allowing the first goal, when they’ve outshot the opponent or been outshot, and in one-goal games. Unfortunately, we haven’t found a page at Hockey-reference.com that includes this information for all teams on one page. But if you just replace one team’s abbreviation for another’s in the URL (example: change https://www.hockey-reference.com/teams/WSH/2018_situational.html to https://www.hockey-reference.com/teams/PIT/2018_situational.html), you can quickly access the situational information for that other team. The Covers NHL matchup pages are a great resource for a lot of different information, and you’ll even find NHL team goals by period broken down into various categories relevant for bettors. In their statistical analysis portion of the matchup page, you can view each team’s period splits overall, home/away, as a favourite, as an underdog, and over the last 10 games. Unlike the other two sites we use for first period stats, Covers lists each team’s goals per period as an average per game, which we like as well. Alright, so you’ve found some places to access NHL first period stats. But how do you apply them to win some more bets? The key is to look for value. If a team is a big favourite on the full-game moneyline, they’re also going to be pretty heavy favourites on the first period lines. So unless their greatest dominance typically comes in first periods while their opponents’ greatest weakness is in the first periods, you’re not really going to get much of a betting advantage. However, if an underdog on the full-game moneyline has better first period stats than the favourite, you’ve found some value. You’ve now got a chance to get plus money return with a team that may actually have a better chance of winning the first period than their opponent, assuming that the teams play to their normal tendencies. Adding #NYR 1P moneyline at +122 odds. Hoping it’s Lundqvist in net for Rags, but always happy to get plus money fading the Kings in 1P at home. LAK have been outscored 19-11 in 1P at home this year, were bad last year as well. The same logic applies to first period over/under betting. Odds on those wagers are generally based on the full-game lines and don’t necessarily reflect each team’s tendencies in first periods. If you can find a matchup of two teams who both score/allow more goals in first periods than any other periods, you may be able to find an edge. Betting on NHL first periods isn’t as simple as completely relying on first period stats. Think of these NHL first period stats as just one tool in your tool box. You should still be looking at things like the recent play of both teams, who the starting goaltenders are, home/away splits, scheduling, history between the teams and, of course, the odds. For example, even if the first period stats favour the Blues tonight, you still might not want to bet on them if they are in a big-time scoring slump and have lost a few in a row. Their confidence won’t be too high coming into this game, and you’ll need them to score at least 1 goal (possibly more, if their opponent scores at all) in order to cash a first period moneyline bet on them. 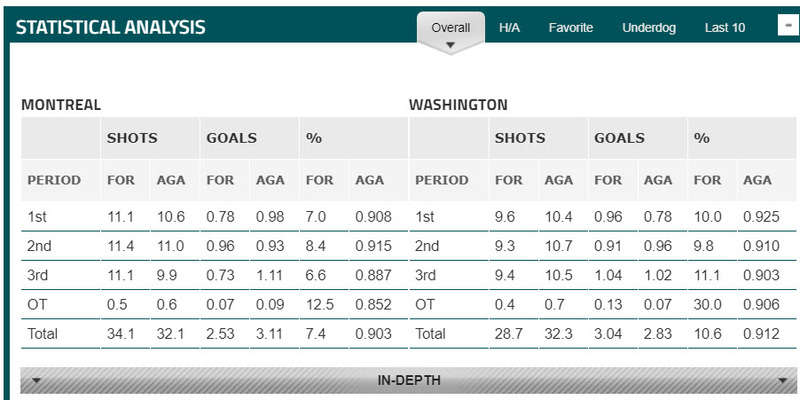 Instead, use the first period stats to complement a play that you already like. One ideal situation is when you like a team to win the game but they’re playing their 4th game in 6 nights and you’re worried about fatigue. That team will be at their freshest in the opening period, so if their first period stats are favourable against tonight’s opponent, playing them on the first period moneyline is a way to back them in a strong situation while limiting the fatigue effect. We also like using first period stats as part of a live betting strategy. If you like a game to go Over the total tonight but the two teams have shown a tendency to play low-scoring first periods, why not wait until the first intermission to bet the Over in live betting instead? You might get a lower total to work with if the first period has 1 or 0 goals scored in it, plus you’ve also eliminated the lowest-scoring periods of these two teams from your wager. Again, don’t just base a wager entirely on NHL first period stats. However, if those stats are supported by a few other situational and statistical angles, you should be able to exploit some favourable odds that the bookmakers haven’t completely accounted for.